Study Mercury Head Dime Prices and Trends Since 1950. This is the entry page for Mercury Head Dimes historic value trends. Retail level Mercury Dime prices from 1950 to the present are reported for individual coins of this series. The data is organized in tabular format. There is one table for each dime. You may use the links directly below to quickly navigate to the value table of interest to you. There is one table for each and every date. Naturally, the 1916-D Mercury Head Dime generates the most traffic, for it is the key date of the entire group. 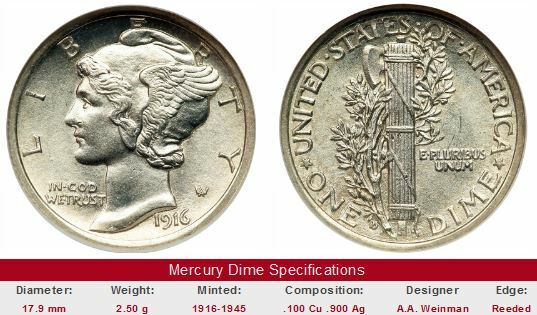 To learn more about the origin of this popular collector dime, we refer you to a brief description of Mercury Dimes. If you want to review trends of another US coin type, then you may return to the Coin Value Tables online report listing, or click the "Get Historic US Coin Values" in the upper right hand corner of this page. The 70-point numeric system (G-4, VG-8, etc.) in widespread use today was popularized by the American Numismatic Association in the late 1970s, an era when coin values were escalating dramatically, most notably for high quality specimens. Vague descriptors such as "Choice" and "Brilliant" were replaced by the more precise numerically determined grades. Thus, finely differentiated grades like MS-60, MS-63, and MS-65 became commonplace, and by the late 1980s, the practice of assigning a numerical grade to indicate quality was universal (this does not imply the 70-point system eliminated grading inconsistencies, but it did help to stabilize the coin collecting hobby). Throughout the 1990s and into the new millennium, more grading subtleties were introduced within the framework of the grading system, including the degree of separation of the horizontal fasces bands on the reverse of mint state Mercury Head dimes. Dimes with rounded, full split bands (abbreviated FSB) are much rarer than dimes with blended, flattened bands, and are more highly prized by discerning collectors/investors, and generally carry substantial premiums. The Coin Value Tables™ trend data for Mercury Head dimes reflect the historic availability of numeric grades and the split band definition to describe coins. For the 1950-1985 rows, the values in the "G-4" column correspond to the "Good" listing of those years, "VG-8" corresponds to "Very Good", and so on. The "MS-60" column records the "Uncirculated" value reported during those same decades. Similarly, "PF-65" corresponds to simple "Proof" figures. Starting in the 1990 row, selected "Uncirculated" grades are broken down into regular and "FSB" columns. Curiously, had a collector paid the "going price" in the 1980s (or earlier) for what was then a mint state Mercury Head dime, one that eventually earned an FSB distinction, he (or she) would have been rewarded with huge price advancements as the split band phenomenon came into full vogue a few years later.